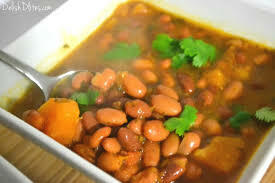 Habichuelas Guisadas Rapiditas - Quick Bean Stew - Tienditadepuertorico.com - Buy Puertorican Food Here!! tomato sauce, and cook over medium heat for 5 minutes. Add the water and calabaza. Bring to a boil, and add the alcaparrado, beans, and black pepper. Bring to a boil again. Reduce the heat and simmer, uncovered, for 15 minutes.